Solar Probe Plus — NASA’s ambitious mission to fly through and examine the sun’s atmosphere — has reached a key stage of development. Solar Probe Plus will begin advanced design, development and testing — a step NASA designates as Phase C — following a successful design review in which an independent assessment board deemed that the mission team, led by the Johns Hopkins University Applied Physics Laboratory (APL) in Laurel, Md., was ready to move ahead with full-scale spacecraft fabrication, assembly, integration and testing. Set to launch in 2018, Solar Probe Plus will orbit the sun 24 times, closing in with the help of seven Venus flybys. At its closest passes the probe will speed 118 miles per second through the sun’s outer atmosphere, or corona, coming about 3.8 million miles (about 6.2 million kilometers) from the surface to explore a region — and face hazards — no other spacecraft has encountered. Solar Probe Plus will carry 10 science instruments specifically designed to help solve two key puzzles of solar physics: why the sun’s outer atmosphere is so much hotter than the sun’s visible surface, and what accelerates the solar wind that affects Earth and our solar system. APL, which manages the mission and leads the spacecraft fabrication and integration effort, has made significant progress on several enabling technologies, such as the carbon-carbon composite heat shield that will protect Solar Probe Plus from temperatures exceeding 2,500 degrees Fahrenheit and impacts from hypervelocity dust particles. Engineers have also built and tested a liquid-cooling system to keep the spacecraft’s solar arrays at safe operating temperature throughout the voyage, and spacecraft parts are undergoing high-velocity dust tests that simulate flights through swarms of high-energy particles near the sun. “Solar Probe Plus is a pathfinder for voyages to other stars and will explore one of the last unexplored regions of the solar system, the solar corona, where space weather is born,” says Lika Guhathakurta, Solar Probe Plus program scientist at NASA Headquarters in Washington. The Solar Probe Plus team includes engineers, scientists, technicians and other experts from government, academia and industry. The mission is part of NASA’s Living With a Star program, designed to learn more about the sun and its effects on planetary systems and human activities. NASA’s Goddard Space Flight Center in Greenbelt, Md., manages the program for the Science Mission Directorate at NASA Headquarters. For more information, visit http://solarprobe.jhuapl.edu. Technicians at the Johns Hopkins University Applied Physics Laboratory in Laurel, Md., prepare an engineering model of the Solar Probe Plus Thermal Protection System, or TPS, for vibration tests in October 2013. The main feature of the TPS is an 8-foot-diameter, 4.5-inch-thick, carbon-carbon, carbon foam shield that will sit atop the Solar Probe Plus spacecraft body. The system will protect Solar Probe Plus from temperatures exceeding 2,500 degrees Fahrenheit and impacts from hypervelocity dust particles as it flies through the sun’s outer atmosphere. The vibration tests simulate the shaking the spacecraft will undergo during launch; Solar Probe Plus is scheduled to launch in 2018. 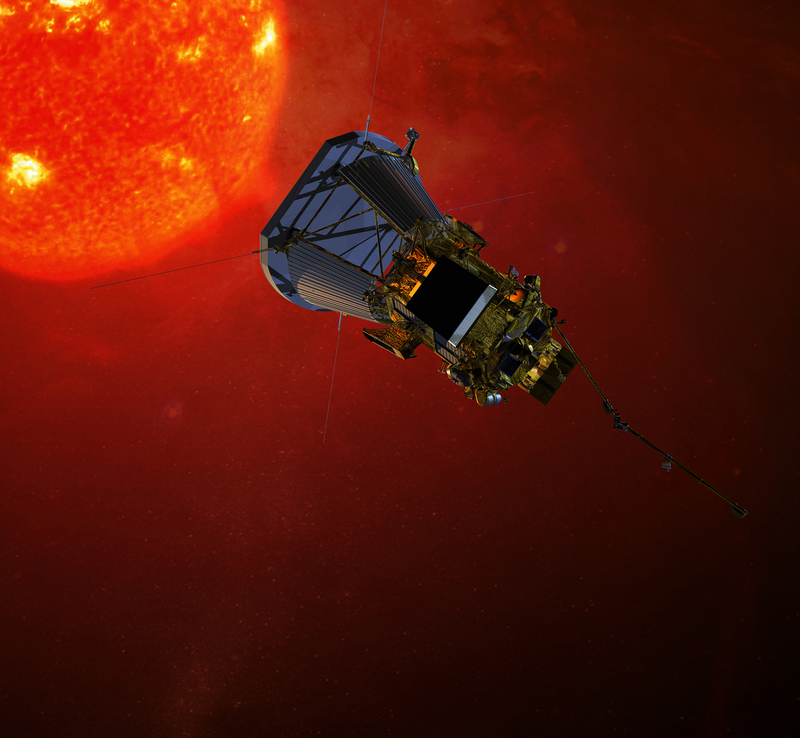 Artist’s impression of NASA’s Solar Probe Plus spacecraft on approach to the sun. Set to launch in 2018, Solar Probe Plus will orbit the sun 24 times, closing in with the help of seven Venus flybys. The spacecraft will carry 10 science instruments specifically designed to solve two key puzzles of solar physics: why the sun’s outer atmosphere is so much hotter than the sun’s visible surface, and what accelerates the solar wind that affects Earth and our solar system. 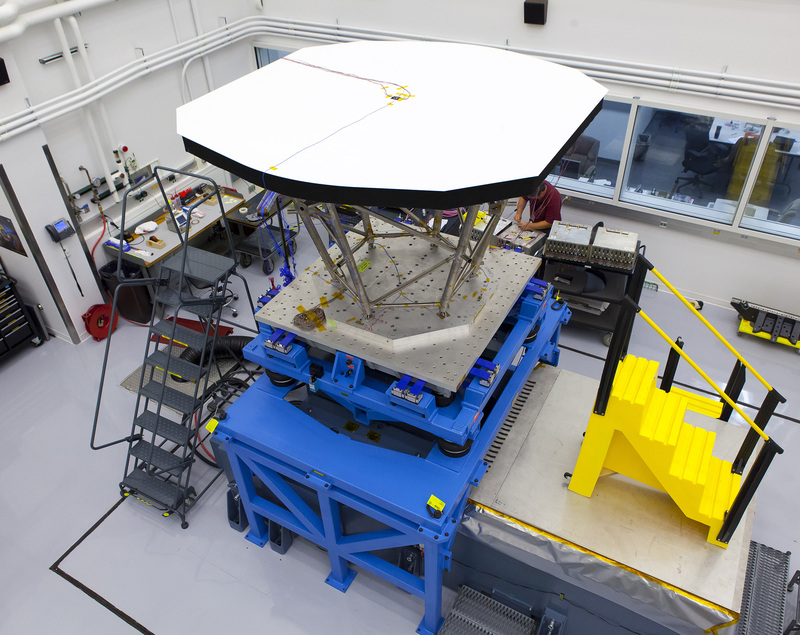 The Johns Hopkins University Applied Physics Laboratory manages the Solar Probe Plus mission for NASA and leads the spacecraft fabrication, integration and testing effort.